It may be furnished, according to its new occupants, just as you would expect “when you have spent £10m of blood money on a house”, but judging by the appearance mid-afternoon of a masked man in camouflage gear carrying two shopping bags from Budgens, no one had thought to fill the fridge. Perhaps when occupying the multimillion-pound London mansion of a tyrant’s son, food is some way down the list of priorities. 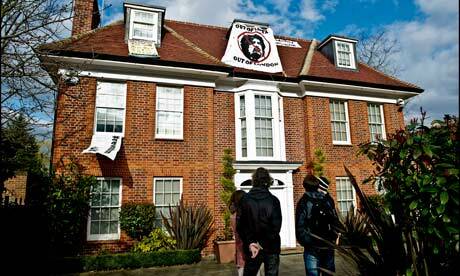 More pressing tasks, for the small group of protesters who have moved into Saif al-Islam Gaddafi’s redbrick Hampstead home, were affixing banners to the roof reading “Revolution” and “Out of Libya, out of London”, and summoning the press, to whom they declared their actions had been taken “in solidarity with the people of Libya, the people of Cairo, the people of Saudi Arabia”. Though there were no Libyans among the group, “we have people from the Middle East and we’re hoping to disseminate the protests more widely”. Further properties would be targeted “if they are owned by dictators, absolutely”. A printed notice declaring their legal rights as squatters and taped to the front door, and the appearance of a man in a yellow tabard with the words “legal observer” handwritten on the back, suggested this was not the first such protest for those involved. The property, the protesters said, was managed by Gaddafi through a holding company registered in the British Cayman Islands. They said they had been alerted anonymously to the address. A number of neighbours have spoken in recent days of their disquiet about living close to the dictator’s son. One, Dr Saul Zadka, told the Hampstead and Highgate Express that residents did not want to live next to Gaddafi, “even though he became a very acceptable figure among the British high society and political echelons”. Around 4pm, assured by telephone that the BBC had arrived, a member of the group climbed out of a window, past a neatly trimmed laurel bush and low box hedgeto address the cameras. “We do not trust the British government to properly seize the Libyan government’s corrupt and stolen assets so we have decided to take matters into our own hands.